In a way, the news that Guinness is launching a bottled ale* takes it right back to its origins – it originally brewed ales, not Porter, and Arthur Guinness rented St James Gate in 1759 as an ale brewery. 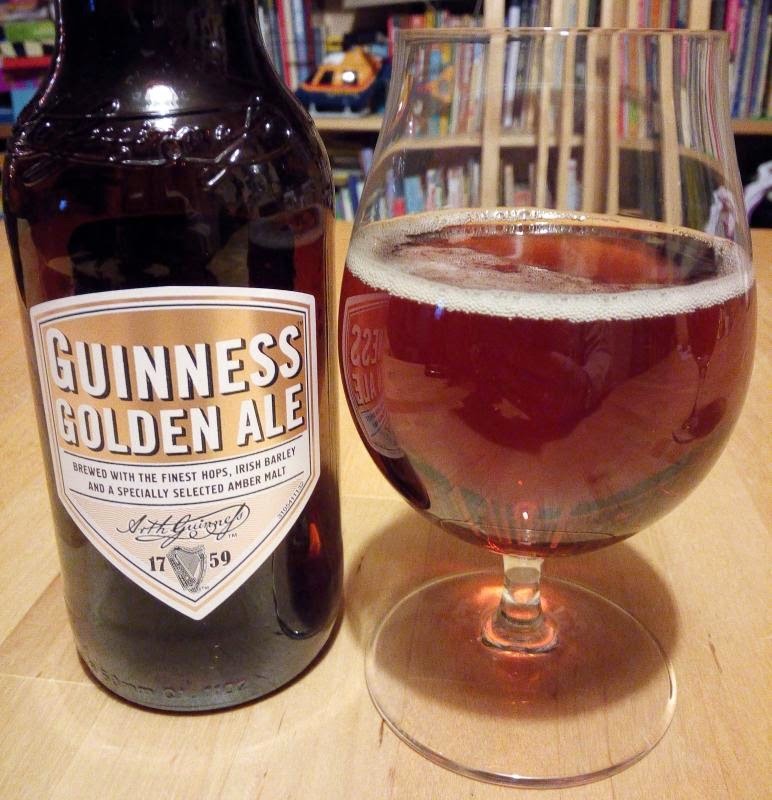 However, unlike the previous two new beers from its pilot brewery, Guinness Golden Ale is not based on anything historic. Instead, it was created by Guinness brewer Peter Simpson in the St James Gate pilot brewery, home to The Brewers Project, which was set up to try out new ingredients and new recipes. I'm told he wanted to make a cross-over beer – an ale that would appeal to lager drinkers and bring them over to ale. Which makes it all the more odd that the result is a crisp and malty brown bitter. It is well made and drinkable, with light floral and biscuit notes on the nose, and then a dry-sweet and crisply bitter body with a faint hint of the toasted caramel that's characteristic of many winter beers. The problem is that apart from the Guinness name, there is nothing here that stands out. I'd drink it again quite cheerfully – it's a good beer – but it is little different from a dozen other 'premium bottled ales'. And the one thing I can't see it being is a cross-over beer for the lager crowd. It's not blonde enough, not light enough, and quite frankly it's too beery. So what is it for? Occupying shelf space and leveraging the Guinness name can only take you so far – if it doesn't continue to sell, it won't keep that shelf space. What it might do is act as a cross-over to tempt curious Draught Guinness drinkers to try ale. It's hard to imagine Guinness doing that deliberately, but the business guru's mantra is “cannibalise your business before someone else does it for you”, and perhaps someone there has picked up on that. Of course the risk is that once you have expanded their taste horizons, they could quickly move on to yet more new ale experiences. What do you think – is Guinness taking a risk here, or simply colonising a bit more space on the supermarket shelf? *under its own name. Of course it already has Smithwicks and others. Are you saying they didn't even get the colour right? I looked at it quite carefully, from several directions, and it definitely looked brown - certainly not what I'd call golden. Most odd. I just tried it and was actually amazed at what a characterless ale they'd created. Nothing pleasant or even interesting about it. I think I know what you mean - a beer designed by a committee, you might say.